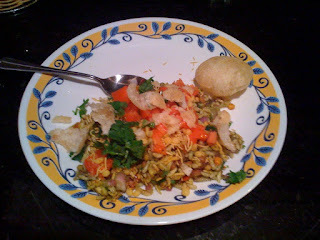 ok.. enough of the senti talk - let's eat some Bhel - shall we? Grind the ingredients for hot - green chutney to a fine paste - Add a little water if you want to get a fine paste. Mix the ingredients for the sweet chutney. If you have bought the Hot Mix packet from Indian store - get rid of (read as eat) the muthiyas in that mix - they are delicious - just not suitable for this bhel. Now take a big bowl and mix the puffed rice and farsan. Add all of the chopped onion, most of the chopped tomatoes (save some for garnish), half of the coriander leaves, a tsp of hot chutney (use more if you like it hot), 3-4 tbsp of sweet chutney and mix well. At this time you could add the optional green mango pieces and boiled potato pieces as well. If it were India, this bhel would go on a serving cone made up of news-paper and you would use a small piece of a magazine cover as a spoon... Enjoy! Yummy want to have it right now.The green chutney recipe sounds interesting will definately try making Bhel your way next time. Yet another extremely well written and yummy recipe .. way to go !